As I’ve written before, I spend less than 1 hour per week on my finances. One of the ways I do it is by chunking my tasks, like keeping an eye on my credit-card bill. Here’s how I do it. I pay with my credit card as much as possible. This lets me automatically download my transactions and categorize my spending. Plus, I get travel points and extra consumer protection (like a free additional warranty for any electronic device — all credit cards offer this). But I do like to keep an eye on my credit-card charges whenever there’s a human involved. So I keep my receipts whenever I go to restaurants and store them in a folder on my desk. What Would An Indian Do? A quick call to my credit card company will resolve this. The most important thing is keeping your receipt folder on your desk. If you have to get up to get it — even a few steps away — that’s a huge barrier to getting this done consistently. Cash always work. I make myself a budget and if I spend that guess what? I stay home. Ramit, Ive been reading your site since the beginning of time. Ok, ok, more like a couple years and I don’t think Ive ever posted a comment….until now. This Halloween I was part of a party a club and my total bill was somewhere in the range of $220.00. 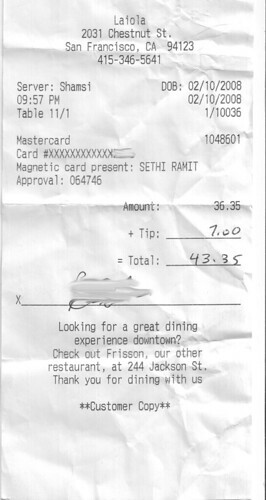 The server was mediocre but I tipped her 25%…well in my slightly alcohol fogged brain I thought it was 25%. So two days later I take a look at my bank account….I was charged $380.00. Luckily I kept my receipt and I checked…sure enough I left $60. Thats right, she ADDED a ‘1’ in front of my 60. Unbelievable eh? Im not an Indian (though I do work in software 😉 ) but I agree…I can’t stress how important to keep your receipts….especially when out drinking! I also got burned by a waitress adding a tip to a receipt (in this case, I had left cash on the table instead of putting it on the card). The management refused to do a refund for the $10 difference, so I did a chargeback for the entire amount through my credit card company. Now I write “cash” in the tip line if I leave cash on the table, and always save my credit card receipts until they post to my account. I’ve just started reading through your website in the last week. Great stuff!! Thanks! The added bonus is that by doing that, you go over your spendings. Especially your going-out spendings. I sometimes look at our receipts and think “what we were thinking?”. I’ve had this happen to me a few times too, though the difference was usually a dollar or so. The credit card company added a few extra dollars for tip, automatically, if I left the tip as cash. Fortunately, the problem would fix itself and the credit card company would credit me back for the extra dollars it charged. And this was without me having to call up the card company. It was weird, and I wonder if this practice is widespread. I have since canceled that card. As for finances, I list everything everything I spend on Excel, categorizing method of spending as cash, check or card. Then at the end of the month, I categorize the expenditures as bills, car expenses, etc. This has worked well for me, hope this gives some tips to other people too. Many credit cards do put a “hold” for an amount greater than what you tip, because for some reason, it takes awhile to properly charge a tip. this usually will only show up when a charge is “pending” though. I don’t think it is unusual or unethical. But placing a 1 in front of $60? Wow. I have a smartphone with my budget spreadsheet in Excel. Everytime I make a purchase, I enter it into my spreadsheet in the appropriate column so I never need to keep receipts. I also notice that my credit card company adds money to some of my purchases at bars/restaurants. But, this only happens in my pending charges. Once they post to my actual transactions it is always correct. I do check my account very often to make sure waitresses don’t add tip to my card, though. I’ve heard bad stories about that…. it’s a good habit to pay attention to that! i recently stumbled upon your site, and its funny, informative and creative, keep up the good work bro. I use cash all the time. That way I don’t even have to worry about being cheated by a restaurant weeks after the fact. I started keeping all my credit card receipts because of traveling with work. Naturally this rolled over into my everyday life. I usually just throw them away once I realize I don’t need them for expenses. Now I’m going to start checking to make sure no one is taking an extra dollar from me. Good approach to getting the extra travel miles – I tend to use my debit card all the time for the same reason. Its a nice easy way to keep track of everything and it doesn’t take hours of time. I spent the last few months completely automating my finances. Besides using ING Online Checking and Savings, I replaced the step of downloading transactions from the credit card or bank website by using Mint.com, which pulls them in automatically for me. This is an excellent tool once you get everything categorized properly. It helps make budgeting much easier as well, especially for people like me whose budget amounts to backwards-looking “man i didn’t realized how much I spent on that stuff last month/year”. I used to do that, but found that it wasn’t helping me get rich, it was keeping me poor. I was never able to save money because I didn’t need to; the ole credit card was my friend, after all. Now I use cash or debit card, and I’m saving money for the first time ever. I am also a fan of using my credit card as much as possible to get the cash back and extra protection it offers (as I look for a new apartment, having the option to pay with a CC for no fee is one of my criteria ). Just by using the card, I’ve managed to accumulate around $400 in cash back. This is $400 I’ve made just by using it, nothing more (and not paying any interest – PAY IT OFF EACH MONTH). It also helps me keep track of what I spend money on and download my spending into Excel. The ability to dispute a charge is a wonderful thing also and has come in handy multiple times. I couldn’t tell you how many times I’ve had servers/bartenders give themselves an extra tip on my card. It has ranged from $10 to $50 of extra tipping. One one occasion I even went back a couple of days later and had the manager pull my receipt. It turned out the bartender actually re-printed the receipt, tipped, and signed it himself. I got all of my money back plus a free lunch. Does the 50 $ instead of 43,35 $ happen often? It doesn’t really matter if it happens often; what matters to me anyway is that if it does I’ll be able to catch it – and that keeping track of my spending like this in general (in my case I write it down as I spend it, either at the time or off of the receipt later, and check it against my online statement as it appears) gives me a huge amount of clarity about what I am spending and whether I’m doing what I want with my money. I haven’t had the problem of people falsifying my receipts to tip themselves more, but I have had other situations like stores accidentally charging me twice or charging me too much for something. And once, my bank put two checks I’d written through twice each – not a receipt problem, but one that I only caught because I was keeping track of my finances. Back in the day, I would have just seen the lower balance, gone “Huh, I thought I had more money than that,” and wandered off. They are so no longer my bank. 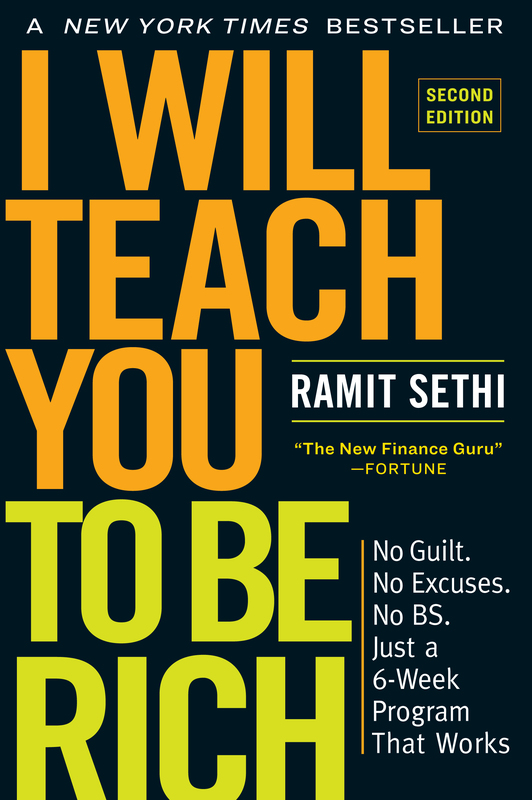 Great advice to keep track of things Ramit.. thanks for the great tip. I thought of using credit cards only for high value purchases.. after reading your post & the comments I realized I can pay & also earn reward points.. that is great. Keep the great work up!!. that is the amount you are agreeing to). Then yes, I do agree to the statement. I also check for double charges. That happens more often than you would think. at a nightclub – some real funny business happens). Good call, Ramit. I also turned this into my paperless rule–unless I would absolutely need the reciept to prove my purchase I deny/throw it away. I don’t need a credit card reciept AND a transaction reciept from McDonalds’ drive through. Immediate recycle. Seriously though, looking at the comments, I have now decided to keep my bar receipts if not the other ones. I keep all my receipts and file them. It’s a good system, especially for stuff that could end up being a tax deduction if you reach above a certain percentage of AGI. I use cash/debit as much as possible as I spend more by using a credit card as I don’t see the immediate effects of spending that money. I always use cash at bars/clubs, using a card at a dark, busy place opens up too many options for mistakes, you often have to remember to go back to get your card if you open a tab and I always end up spending more money with my card at bars/clubs when inebriated, haha. Setting a certain cash amount I’m comfortable with spending before I go out has probably saved me hundreds thus far. i hope the tip means 7 and not 1 dollar. I technically don’t keep most receipts… unless I want to use it for tax purposes. I use a PDA money managing software (Pocket Money in my case) and since my PDA is also my cellphone, it goes with me everywhere I go. So, every time I make a purchase, right after the cashier rings me up, I would double check the receipt to make sure it’s right, punch the amount into my PDA, and my money is updated instantly…. At the end of every pay period, when I pay my bills online, I’ll also double check my bank accounts and confirm all my transactions with my PDA entries. I really, really love this system. I could never keep up with a stack of receipts. That’s just too masochist for me. One thing that I do that helps me all credit card charges are emailed to me and I receive txt messages for anything over $75. I find this to be useful to keep track of my spending while it is fresh in my mind. I do like you idea and I think I will start to sit down and double check my charges. @rauschi81: $36.35 + $1 doesn’t equal $43.35. You say it takes 5 minutes to check… but doesn’t it take some time to scan all of these receipts in? Why do you need to scan the receipts in? I just use a folder on my desk to store the receipts for that week. I just picked up Neat Receipts. Credit card receipts have always been a headache for me. This application looks like it is going to make my life a little simpler. I happened to get a great deal on it at Costco. I also had a tech issue that needed attention and their support staff immediately responded to my request and handled my concern in minutes. Check it out at www.neatreceipts.com. I do the same thing recommended here, but I use Quicken which is a great tool for this. Quicken goes out and downloads all my latest transactions, and then displays them for me to review, categorize (for tax purposes) and accept them individually. It forces me to review each transaction so I can keep track of what is going on. To prevent adding that extra 1 to make it $160, I always add the dollar sign really close to the first digit, so they cant possibly even fit a legible 1 in there. Always include the dollar sign whenever you write down a figure, even if it’s the tip line. I like the tip about writing cash when you leave a cash tip too. I use my debit card a lot instead of credit card and always record the amount in the register. However, recording it in your register, either paper or digital, won’t help if you get charged the wrong amount and want to contest it. You need the receipt as proof of what you charged. It’s too easy to accidentally record the wrong amount in a register. You make a great suggestion in using your credit card as often as possible. Many personal finance “experts”, especially those who aim toward a younger crowd, admonish us against using plastic, especially for everyday purchases. I guess their advice is a broad stroke suggestion intended mostly for those who tend to view credit as free money and subsequently abuse the cards. But for those who are responsible with their money, credit cards offer great convenience and protection, just like you say. When used in conjunction with an online budgeting program like Mint, credit cards make tracking your spending a breeze. Equally good, most cards offer attractive rewards programs. Personally, I like the United Mileage card. Based on my spending, I can rack up enough points for one or two free trips per year. Quick story from a former server. I received a $3.00 tip on a $80.00 tab. This was after the patrons told me that I had done an excellent job, I think they just really didn’t believe in tipping. It would have been very easy for me to change the 3 to an 8 and the total from 83 to 88. And that still would have only been a 10% tip. However, that’s definitely not what I’m about and I left everything in check, but I think you can see how easy it would have been for someone with different morals to have reacted differently. Thus, it is very important to pay attention. If you pay with a card but leave a cash tip, be sure to still completely fill out the slip and that should help to prevent some hassles. This is great, Ramit. I’ve had a lot of people try to take advantage of me, more here in Florida than in California. I think we’ll try this! Thanks! I too use my credit card for as much as I can to earn the fabulous cash back rewards. But, I have one rule, never charge at a restaurant or a bar. Whether it’s fast-food or or a super classy steakhouse … I only pay cash. I figure that either I have enough cash to put in my pocket and pay for that dinner and drinks or I need to stay home that evening. I like this suggest very much, I’m using it right now. This is much easier then one big reconcile at the end of the month that I use to do. thanks and keep up the great blog. What would an Indian do? Is this some sort of racial stereotype that I do not understand? Can you enlighten me? I am an Indian, Living in Bangalore… I am a software engineer.. Thanks to your blog, I am getting educated regarding finances and personal finance through your blog.. I make sure I read your blogs.. and also J.D’s… I think its pretty cool.. I was all the time a silent reader cause its all AMERICAN.. I think you are doing a fabulous job.. I also think WWAID is sort of off color. I don’t think it matters your nationality, having a solid grip on your finances and making sure that you don’t get ripped off is a pretty universal desire. WWAFPD? What would a frugal person do? This post did open my eyes to something to look out for, I would normally have thrown restaurant receipts out right away. I live in the mid-west and I think sometimes it makes me too trusting of people to do the right thing. Wouldn’t doing that miss any false charges to your account? If all you’re doing is ctrl+f your actual receipts, someone that stole your number and charged you will get by. Also receipts you lose/didn’t print from your computer/never got a receipt, won’t be counted. I export them off my CC website to excel and delete them off the list as I find them to make sure I get everything on my statement. WWAID – I love it! I’m an “Indian Specialist” in my job as most of my buyers are Indians. Boy, aren’t they even tougher (tight arse) than Chinese when it comes to money and negotiation. Don’t get upset with this comment, I’m just talking about a fact. LOL. I’m a Chinese myself but ahs been an Australian citizen nerly 3 decases. I think beiing an Indian in origin helps you to come up with such a good book as “I Will Teach You To Be Rich”. Your article on barriers is pretty cool. Basically, barriers acts as self-sabotages.